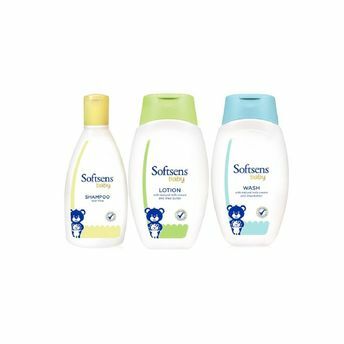 Softsens Baby Shampoo is specially formulated with a "Tear Free" formula for cleansing your baby's hair and tiny scalp in the most gentle and caring manner along with a whole lot of love & care. Its mild ingredients work together to nourish the hair and scalp, leaving it soft, fresh and sweetly scented. You'll be left smelling their soft, fresh and sweetly-scented heads long after bath-time is over. It is hypoallergenic and dermatologically tested for mildness. Formulated by experts, with an ultra mild "Tear Free" formulation, that doesn't irritate the skin and eyes. Safe for use on all hair types.